Joshua Allen Reinwasser, age 23 of Royal Oak, passed away Sunday, November 11, 2018. He was born October 26, 1995 in Flint to Allen Reinwasser and Lisa Heintz. Josh was a 2014 graduate of Royal Oak High School. 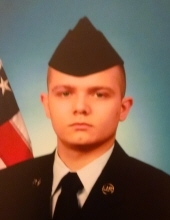 Following graduation, Josh enlisted in the US Air Force and was awarded the Air Force Good Conduct Medal, National Defense Service Medal, Global War on Terrorism Service Medal, and Air Force Training Ribbon for his service. He will be remembered for his love of Science Fiction and Fantasy, his ability to marinate a perfect steak, and being the person that could always make you laugh. But most of all he will always be known as a loving father, husband, son, brother; and grandson. He is survived by his wife, Ivy, whom he married May 18, 2015 in Birmingham; his sweet daughter, Selene; his parents, Lisa Heintz and Allen Reinwasser; step-mother, Lori Reinwasser; step-father, Kurt Heintz; mother-in-law, Heather Zayne; father-in-law, Jeremy Hall; grandparents, Catherine and Michael Petty, Cynthia Heintz, and Denise Reinwasser; his siblings, Dierk Heintz, Megan Reinwasser, Caitlin Reinwasser, and Dominik Heintz; and many loving aunts, uncles, and cousins. Preceding him in death are his grandparents, Eugene Reinwasser, Karen Deuel, Rev. Norman Heintz, and Thomas and Joy Stroshein. The family will receive friends Saturday, November 17 from 1 PM until the time of the service 6 PM at the Sawyer-Fuller Funeral Home, 2125 12 Mile Road, Berkley (two blocks west of Woodward Avenue). Inurnment will take place privately at Great Lakes National Cemetery in Holly. Memorial contributions would be appreciated to the family. To send flowers or a remembrance gift to the family of Joshua Allen Reinwasser, please visit our Tribute Store. "Email Address" would like to share the life celebration of Joshua Allen Reinwasser. Click on the "link" to go to share a favorite memory or leave a condolence message for the family.